The Centers for Disease Control have found that diabetes is more common in Appalachia than in the nation as a whole. 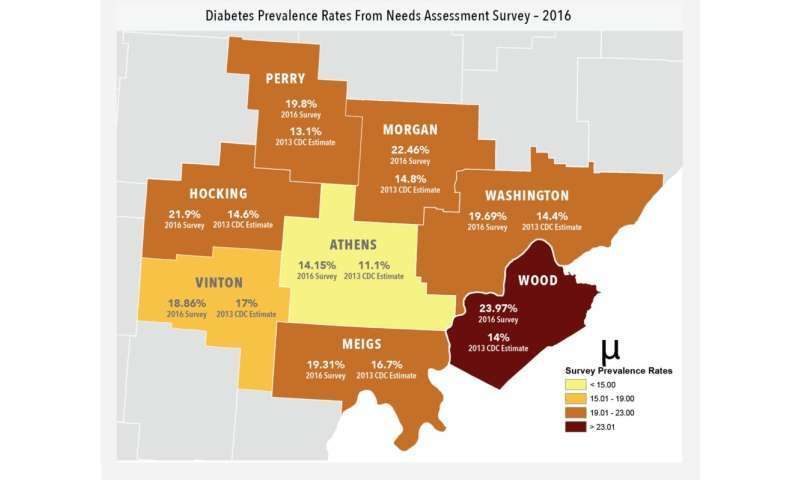 And according to a recent needs assessment by the Diabetes Institute at the Ohio University Heritage College of Osteopathic Medicine, its prevalence in the southeastern Ohio region is even higher than CDC estimates from a few years ago. An executive summary of the study says that in Athens County and the seven counties that border it in Ohio and West Virginia, about every fifth adult has been diagnosed with Type 1 or Type 2 diabetes. Of these, about one-third report they are taking insulin. The assessment, produced in partnership with the Ohio University Voinovich School of Leadership and Public Affairs, outlines what life is like for area residents living with diabetes; serves as a guide for the Institute's strategic planning; and provides insights to support diabetes care, prevention and education in the region. It was partly funded by an Ohio University Innovation Strategy planning grant awarded to the Diabetes Institute in early 2016. Diabetes Institute Executive Director Darlene Berryman, Ph.D., who also serves as interim associate dean for research and innovation at the Heritage College, said the Institute will be "paying close attention to the message coming from both diabetes patients and providers, who told us that diabetes education is extremely valuable and highly needed, but potentially not available or best aligned to meet the needs of patients in the region." Heritage College Executive Dean Kenneth Johnson, D.O., called the report a valuable tool that will help the college combat diabetes in southeastern Ohio. "One of the central goals laid out in the Vision 2020 award from the Osteopathic Heritage Foundation was that our college take aggressive action to address the high rates of diabetes in this region, through both research and community outreach," Johnson said. "This new needs assessment will help us design customized programs and focus our efforts more efficiently to provide the maximum benefit for local diabetes patients." A weighted phone survey of 1,884 adults found diabetes rates in the eight-county region ranging from slightly over 14 percent in Athens County to almost 24 percent in Wood County, W.Va. In every county, the survey found diabetes rates higher than the CDC's 2013 estimates, which ranged from around 11 percent in Athens County to 17 percent in Vinton County. A likely contributing factor, the report says, is the high obesity rate in the region. When the CDC issued its estimates in 2013, it found that the percentage of people in the region whose body mass index qualified them as overweight or obese ranged from about 28 percent (Athens) to over 37 percent (Hocking). In the 2016 survey conducted by the Diabetes Institute, overweight/obesity rates were higher for all counties except Athens, topping 48 percent in Vinton County. The needs assessment also included focus group discussions and interviews with people experiencing diabetes and health care providers who treat patients with the disease. With education being a crucial element in combating diabetes, the survey looked at how well health professionals provided information to newly diagnosed patients. The findings varied widely, with some patients saying they had been given a wealth of information and/or referred to a specialist, and others reporting the opposite. Many patients who had taken a class to learn more about the disease said it was one of the most helpful things they had done to manage their diabetes. But while nearly 70 percent of the participants in focus groups and interviews said they had taken such a class, less than half of those surveyed by phone had done so. Care providers noted that many area patients don't take their diabetes as seriously as it deserves because they don't feel particularly sick when they're first diagnosed. One reason for this attitude, providers said, might be the fact that diabetes is so common in the region. Flaws in the health care system also play a role, the assessment suggests. Though health insurance coverage rates in the region have improved – and almost all survey respondents reported having some form of health insurance – getting reimbursements is still a challenge. Patients in focus groups noted that diabetic supplies and medications can be quite expensive and complained they find it confusing to figure out what their insurance plans cover. Providers added that social determinants of health – income, education levels, housing, food insecurity, transportation and a shortage of diabetes specialists in the region – also present challenges. For those with diabetes, commonly reported reasons for delays in seeking medical care include lack of transportation (over 41 percent of respondents); finding a medical office closed when they arrived (over 25 percent); and inability to get through to the provider on the phone (over 24 percent). Recommendations from care providers include creating culturally sensitive education materials aimed at local people – for example, Appalachian cookbooks catering to all reading levels and offering recipes for healthy versions of well-known Appalachian meals. Another boon, providers said, would be a regional telemedicine network to help overcome the shortage of specialists and the transportation issues some residents face. The assessment found that lifestyle factors, including a dearth of adequate exercise and a failure to eat enough fruits and vegetables, probably contribute to elevated diabetes rates. Though patients did understand the importance of exercise and diet, they cited barriers to putting that knowledge into action – such as the cost of good quality produce and a lack of nearby, safe locations to exercise. The needs assessment reports that the Diabetes Institute will strategically align its focus areas to address these recommendations. "Strengthening existing partnerships while establishing new collaborations throughout the region will be essential in this work. Building on the assets of all partners will create the most impact as we address the burden of diabetes in this region of Appalachia."